Described once as “Britain’s best kept secret” Alexander Baillie has become internationally recognised as one of the finest cellists of his generation. He began playing the cello aged twelve inspired by the late Jacqueline du Pré then studied at London’s Royal College of Music and with André Navarra in Vienna. He has appeared with many British orchestras and has worked with Sir Simon Rattle, Sir John Eliot Gardiner and has appeared regularly as cello soloist in concertos, recitals and festivals throughout the world. He has given notable first performances at the BBC “Proms” of works by Hans Werner Henze, Takemitsu and Colin Matthews. Recordings include the Tippett Triple Concerto with the composer conducting and the Shostakovich First Concerto with Benjamin Zander and the Boston Philharmonic. His version of the Britten Cello Suites achieved the highest acclaim in the New York press. Together with pianist partner James Lisney he has been promoting their “Beethoven Project” in England and Germany. He features in the film “Dvorak…who?” about the motivation for young people falling in love with classical music. 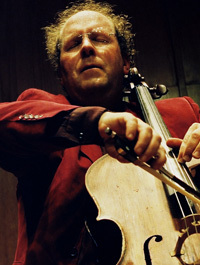 He is Professor of Cello at the Hochschule für Künste, Bremen, founder member of “Gathering of the Clans” Cello School and Honorary Doctor of Music at Hertfordshire University. Recent recordings include the complete cello/piano music of Thomas Schmidt-Kowalski on NAXOS and a double album “Jewels in the Crown” of British cello sonatas (Bridge, Ireland, Delius, Rubbra, Rebecca Clarke etc) on the SOMM label.